Congratulations to Kimberly Koehr who won a free 2019 WYL registration as part of our raffle to raise funds for WA Lacrosse scholarships. WYL will provide scholarships to one boy and one girl for WA Lacrosse as our way of thanking them for their many years of WYL participation. Thanks to Kimberly and everyone else who participated in this special cause. Give Your Favorite Lax Player the Perfect Gift! 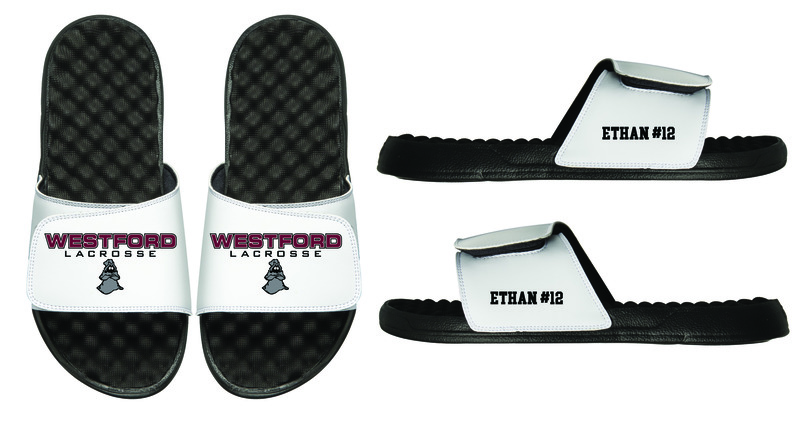 Order custom slides for your favorite Lax player or parent. Available in White or Black and 2 different styles. Free personalization as well. Check out the ISlide web site for more information. Westford Youth Lacrosse is dedicated to teaching teamwork, providing healthy exercise and developing creative problem-solving skills. Through our integrated programs, we provide a fun, recreational and instructional environment for young lacrosse players, fostering a love of the sport. Our program provides learning for all levels by providing great lacrosse experiences for all the boys and girls in the program regardless of skill level. We welcome all new and returning players at any grade, age or skill level.